Rewarding yourself without food. I think that was one of the hardest things I had to work on when I first started trying to change my body - even now, sugar remains my vice. Ultimately, I think the problem is that chocolate and biscuits are delicious and affordable, and as they're available in a range of different extents, from custard creams to giant, freshly-baked monsters, they're appropriate for any level of celebration. But because they're so affordable and so easy to buy (and eat), it's easy to turn to food as a reward simply because there's an option for every celebration. And that's not good if you're rewarding yourself for good progress in your fitness, be it weight loss, toning, strength or beating your personal best, because it's a step towards compromising exactly what you're proud of. This is not to say that gourmet marshmallows, epic freshly baked brownies or a night out to dinner can't be a reward, but it is to say that you need to limit it. I keep dinner for my birthday and Seeg's, or for achievements like an art exhibit in a gallery or publishing my book. I keep chocolate and similar for birthdays and anniversaries, which means they're never really a reward, so much as a treat. The trick when it comes to rewarding yourself with something other than food is simply broadening your mind. Find things relevant to what you're rewarding yourself for. A skin treatment - in a spa or at home in your jim jams - is a great option for health-related achievements like tidying up your eating, giving up smoking, giving up alcohol and so on, because a spa treatment can make you feel even cleaner and more sparkly. If you're rewarding yourself for reaching milestones in your handmade business, some new bookkeeping stationery or luxury craft tools you've had your eye on for ages are also fabulous ideas that can help propel you towards your next milestone. But when it comes to fitness, my favourite way to treat myself is with new exercise clothes. New active wear. It's relevant, but it's also a bit of an investment - no point buying it if I'm going to give up on my workout, right? And there are so many gorgeous brands out there that, these days, you're seriously spoiled for choice regardless of your budget! My most recent, a reward for not only completing my Christmas workout but also for getting my eating back on track after the Christmas and birthday season, were some gorgeous capris from StyleWe. Most of my fitness style preferences are loud - I usually go for quite muted tops, I like them to be plain black but they have to have something going on at the back. A simple black tank will never do. But when it comes to my leggings and capris, I love bright colours, messy patterns, unique prints, and so on. But with the fact that I took up meditation last month, I felt it was time I added something more muted to my collection. I've been looking for a while, and I've always liked leggings with mesh panels on the legs, but I've never bought them because the focus was generally on that panel rather than colour or print. But this time, that's what I wanted, so when I saw these wonderful grey capris with a lovely white mesh panel creeping up the leg, I had to have them. They fit wonderfully - these days, most active wear have flat-lock seams and wonderful wide, flat waist bands which are immensely flattering, and these are no different. They breathe well, they look lovely, and the mesh panel doesn't ride up. I've used them against kickboxing, kettlebells, and yoga, and they've stood up (get it?) just fine against all the movements. Buying something that I'm going to use, will make me look and feel good, and generally provide me motivation to keep going is the best way to reward myself. Because, while the reward should be the results of your hard work, having a stylish little boost certainly helps to maintain enthusiasm and momentum, and that ultimately contributes to ongoing improvements in your skill and results. StyleWe agrees, of course, and as an incentive to help keep you on track - we've just stumbled into February and, for many of us, New Year Resolutions have become a bit tiresome - they are offering one of you lucky readers any single item of clothing from their site worth up to $60 - be it regular, fashionable clothing or activewear. For anyone interested, these WakingBee capris were $49. 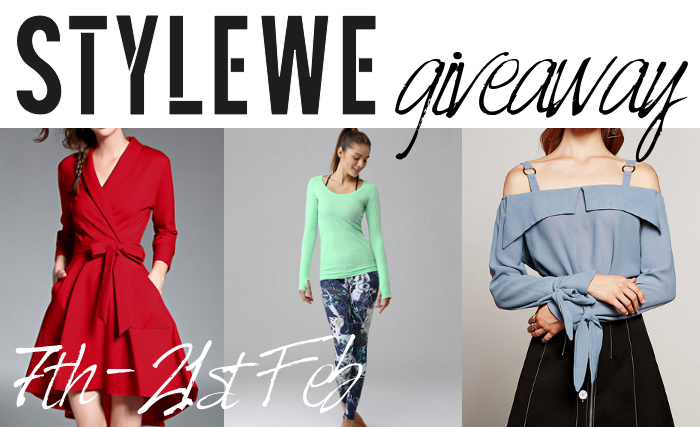 Because the prize is shipped straight from StyleWe, this giveaway is under their shipping restrictions, meaning that the giveaway is only open to residents of the UK, Germany, Italy, France, Canada, USA and Australia. The winner will be contacted by myself initially and will be given 72 hours to respond and accept the prize. They will then be contacted by StyleWe to confirm what item of clothing they would like, which will then be shipped directly to them from StyleWe. Only one item of clothing may be selected, up to the value of $60. There is no cash alternative. Enter using the widget below - good luck! I love little rewards. They give you something to work towards! I have a deadline coming up at work soon - if I get through that I'm going to try beautcamp at barre. It normally clashes with my yoga class but hopefully post-deadline I won't need the midweek destressing session as much. I'll be rewarding myself for a year of super hard work! I'd be rewarding myself for getting fitter after Christmas and (so far) keeping it up! I'd get a new dress that suits my new shape! I'm rewarding myself for keeping up my exercise regime and vegan diet throughout January. I will reward myself for eating super healthy lately with a nice dinner out with dessert! I plan to be rewarding myself for losing the last 20 pounds of baby weight! (only 7 more to go!) I plan to reward myself by buying some new clothes that actually fit! I am going to reward myself with a new pair of running shoes after wearing mine out sticking to my exercise schedule/goals.